A star from Kirkus for J. Anderson Coats's THE WICKED AND THE JUST, due out April 17, 2012 from Houghton Mifflin Harcourt! Two girls of very different degree are brought together unwillingly by the English conquest of Wales. Cecily is in a pet at having to leave the home of her youth—where her mother is buried—and relocate to the Welsh frontier, but her father is a younger son. He will take a burgage in Caernarvon, recently conquered by Edward I. In exchange for a home, he will help to keep the King's peace. Cecily hates Caernarvon. She hates its weather, its primitive appointments and its natives, especially Gwinny, the servant girl who doesn't obey, and the young man who stares at her. It would be easy to dismiss this book as a Karen Cushman knockoff; Cecily's voice certainly has a pertness that recalls Catherine, Called Birdy. But there's more of an edge, conveyed both in the appalling ease with which Cecily dismisses the Welsh as subhuman and in Gwinny's fierce parallel narrative. "I could kill the brat a hundred different ways." Never opting for the easy characterization, debut author Coats compellingly re-creates this occupation from both sides. It all leads to an ending so brutal and unexpected it will take readers' breath away even as it makes them think hard about the title. A Rule-Breaking Book Deal for Luke Reynolds! Anyone who knows Luke Reynolds will not be at all surprised to hear that his first EMLA book deal is a collaborative project designed to inspire and challenge teens, and that all of the royalties—both from contributors and for himself as editor—are being donated to the Children’s Defense Fund. I first heard about this project in its very early stages: as a long-time middle school teacher, Luke constantly found himself struggling with teens’ perceptions of what society tells them they “must do” in order to have a successful, happy, and productive life. But are those “rules” always the best way to run your life? With the goal of providing answers for his students (and others like them) in an appealing way, BREAK THESE RULES was born. Luke began corresponding with various YA and MG authors with the idea of putting together a series of first-person essays on this subject. The anthology will features contributions from authors such as Sara Zarr, Gary Schmidt, Kathryn Erskine, and EMLA’s own Olugbemisola Rhuday-Perkovitch, among many others. This week, I am thrilled to announce that BREAK THESE RULES will be published in fall 2013 by Lisa Reardon at Chicago Review Press. I am so honored to be involved with this deal and can’t wait to see the finished result! Three stars for Grave Mercy! And three stars for Robin LaFevers' GRAVE MERCY! A Star for The False Prince! A Picture Book for Anna! It doesn’t seem like long ago at all that I was standing in this very spot, announcing that Anna Staniszewski’s delightful middle-grade novel MY VERY UN-FAIRY TALE LIFE was going to be a three-book series. And now? It gets even better! This week I was delighted to close a deal for Anna’s debut picture book, the hilarious and quirky DOGOSAURUS REX. The story begins when our young hero comes home from the pound with Sadie, who is warm and wonderful and perfect in every way a dog should be. Yet something about Sadie remains decidedly un-doglike. Will Sadie ever find a way to belong? I loved this manuscript from the first read, and I could not be happier to announce that Anna has accepted a publication offer from Sally Doherty at Henry Holt Books for Young Readers. They are looking at a tentative publication date of Spring 2014, and I have no idea how we are all going to wait until then. A Star for the Baseball Playing Brothers! We are so pleased at the early reception this book is getting for both Audrey and for illustrator Steven Salerno—what a great match of text and art! Congratulations, Audrey! Nothing Like a Green Garden in Winter! 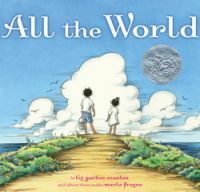 Author of Caldecott Honor book ALL THE WORLD Liz Garton Scanlon's THANK YOU, GARDEN, a lyrical tribute to gardens and gardening, to Allyn Johnston at Beach Lane Books, by Erin Murphy of Erin Murphy Literary Agency. When Liz first sent me this story, she said she was tinkering with the idea of how tending a garden is tending a small piece of the earth, and oh, is this a lovely celebration of that process, and to what the earth gives to us in return. Liz's editor, Allyn, shared that she was sitting at the very same spot at her dining table when she first read THANK YOU, GARDEN as she was the first time she read ALL THE WORLD. It was, randomly, a Tuesday night. "I had been behind on things and bummed about it," Allyn told me, "and suddenly in that moment and in that spot with no prompting from anyone, I just decided, 'Oh, what the hell. It's time.' I don't think enough people realize how scary it is for an editor to read a new manuscript by an author she loves and whose work she loves." It was meant to be! That's Three Stars for WE'VE GOT A JOB! parents. Washington Booker lived in poverty in the projects; for him the police were the ultimate terror. Is the unusually balmy weather in the East soothing you into thinking spring is on the way? Has the record snowfall and ice in the West reminded you that it's still winter? Whatever the season, check out our new books for February! 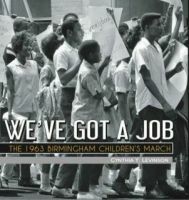 We've Got a Job by Cynthia Levinson tells the true story of the Birmingham Children's March in May 1963, where children, voluntarily arrested and put in jail, brought desegregation to an entire city, published by Peachtree. The Jade Notebook by Laura Resau wraps up her Notebook series (The Indigo Notebook, The Ruby Notebook), continuing the story of Zeeta searching for her father and learning a lot about herself along the way, published by Delacorte/Random House. Clorinda Plays Baseball! by Robert Kinerk (Steven Kellogg, illus.) continues the story of the amazing cow, Clorinda, and how she fares playing bovine baseball, published by Paula Wiseman Books/S&S. So You Want To Be a Rock Star by Audrey Vernick (Kirstie Edmunds, illus.) is the essential primer on everything rock ’n’ roll, published by Walker/Bloomsbury. We wish these book into readers' hearts!